Murder by Gaslight: Murder on Christmas Morning. A Motorman Falls Asleep in a Barroom and Shoots the Saloonkeeper When the Latter Attempts to Eject Him. Christmas was unfortunately marked in Jersey City by a tragedy. Nicholas Schmitt, fifty-three years old, a saloonkeeper at No. 1,134 Summit ave., was shot and instantly killed by Theodore Brunnert, twenty-three years old, of Homestead. The police acted promptly, and Brunnert is in custody on a charge of murder. 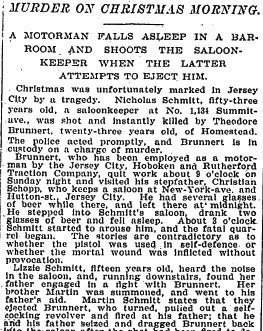 Brunnert, who has been employed as a motorman by the Jersey City, Hoboken and Rutherford Traction Company, quit work about 9 o’clock on Sunday night and visited his stepfatner Christian Schopp, who keeps a saloon at New-York-ave. and Hutton-st., Jersey City. He had several glasses of beer while there, and left there at midnight. He stepped into Schmitt’s saloon, drank two glasses of beer and fell asleep. About 3 o’clock Schmitt started to arouse him, and the fatal quarrel began. The stories are contradictory as to whether the pistol was used in self-defense or whether the mortal wound was inflicted without provocation. Lizzie Schmitt, fifteen years old, heard the noise in the saloon, and running downstairs, found her father engaged in a fight with Brunnert.Her brother Martin was summoned, and went to his father’s aid. Martin Schmitt states that they ejected Burnnert back into the saloon after the shot had been fired to detain him, but Brunnert broke away and escaped, as he fled, Martin Schmitt said, his father reeled and fell lifeless. Brunnert alleges that Schmitt and his son had him down and were clubbing and kicking him when he drew his pistol and fired, as he feared they would kill him. Brunert’s face is badly swollen, and his head is cut and both eyes are discolored, and the police found a club that belonged to Schmitt broken in two and lying on the floor, and suspect that it was broken on Brunnert. The Schmitts quickly informed Policeman Saunders of the fatal assult. Brunnert was a stranger, but they know that he wore a uniform of a motorman. The uniform and description of Brunnert were the only clews. Saunderspromptly reported the tragedy, and Captain Wohlleben and Inspector Archibold, who is in command of the Department, as Chief Murphy is ill, where summoned. A policeman was sent to the Traction company’s office at Hoboken, and Saunders was sent to the power house at Secaucus. The latter learned that Brunner, who lived at the Plank Road at Homestead, answered the description and proceeded to Homestead, where the inspector, captain and Patrolman Holderer were waiting. They visited the house where Brunnert boarded about 6 o’clock. He had gone to bed and left word to be called at 10 o’clock. Officer Holderer followed the woman to Brunnert’s room and arrested the man. He admitted that he had shot Schmitt, but was not aware of the fact that the wound was mortal, and he was not informed of the death of Schmitt until he had been lodged in the Sixth Precinct police station, where he made a statement, after having been warned that anything he might say would be used against him. He stated that he was roughly handled by Schmitt in awakening him, and when he objected Schmitt became more violent, as was reinforced by his son. The forced him to the floor and were kicking and clubbing him when he pulled out his pistol and fired. He is held without bail. 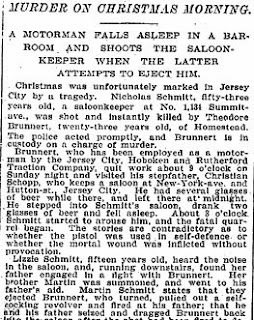 The police believe that if they had not moved so promptly word would have reached Brunnert, and he would have fled. The prisoner is unmarried and has served in the Navy, and it is said deserted from the Army. Schmitt leaves a widow and six children, five sons and one daughter. The youngest child is ten years old. Scenes from the Burdell Murder.